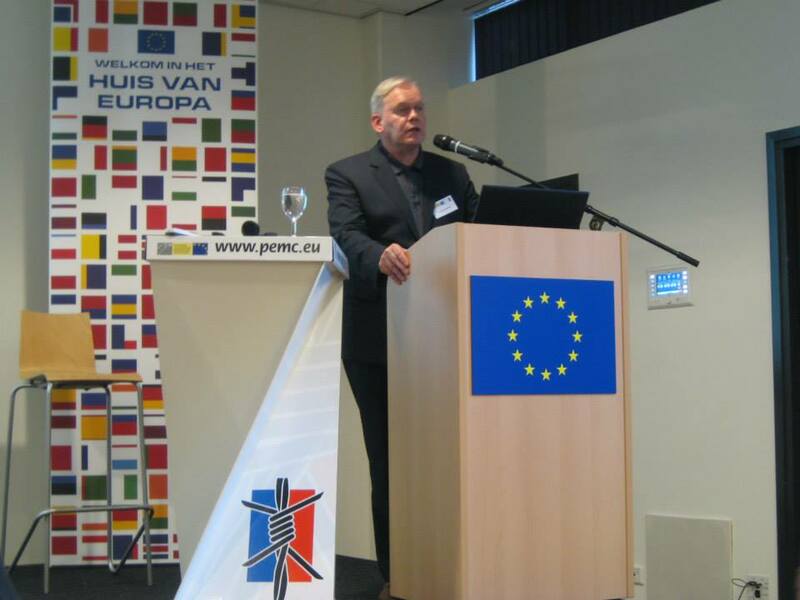 In the Hague 12 November 2013, the application of RNH, the Icelandic Research Centre for Innovation and Economic Growth, to join the Platform of European Memory and Conscience was accepted. Formed in 2011 in response to the resolutions by the European Council and the European Parliament in memory of victims of totalitarianism, Nazism and communism, the Platform held its annual meeting in the Hague. At the meeting, Professor Hannes H. Gissurarson gave a presentation on the joint RNH-AECR project, “Europe of the Victims: Remembering Communism”. He explained the two reasons why the emphasis was on communism rather than Nazism. First, the evil of Nazism had firmly entered the Western consciousness at the end of the 2nd World War, when photographs and films of the extermination camps were shot and shown. In the second place, the Icelandic communist movement was relatively strong, and still had its defenders. 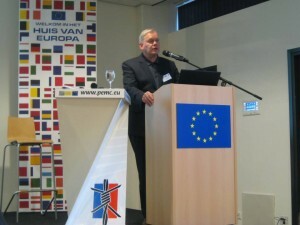 Professor Gissurarson gave an account of the major events in the project. Many distinguished scholars and authors had visited Iceland: Professor Bent Jensen, the foremost Danish author on the Nordic communist movement, Professor Niels Erik Rosenfeldt, a Danish specialist on the Comintern and the author of a thorough examination in two volumes of its secret apparatus, Professor Oystein Sorensen, a Norwegian expert on totalitarian ideology, Professor Stéphane Courtois, editor of the seminal 1997 Black Book of Communism, Anna Funder, Australian author of much-acclaimed Stasiland, Dr. Pawel Ukielski, deputy director of the Warsaw Museum of the 1944 Rising, Dr. Mart Nuut,, historian and member of Estonian Parliament, and Dr. Andreja Zver, director of Slovenian Institute of National Reconciliation. Moreover, a photo exhibition on “International Communism and Iceland” was held at the National Library of Iceland 23 August to 16 September 2013, with many historic photographs from domestic and foreign photo libraries and private archives. Gissurarson in the Hague 12 November. Photo: Karl Altau. Professor Gissurarson also gave an outline of two lectures that he had held himself in connection with the project. First, he read a paper in November 2012 in defence of Jung Chang and Jon Halliday, authors of the famous biography, Mao: The Unknown Story. An Icelandic employee of the present Chinese dictatorship had published a long attack on their work in Saga, the journal of the Icelandic Historical Association, while the book was still being translated into Icelandic. The second lecture was delivered in October 2013 on “Different Nations — Shared Experiences”, where Professor Gissurarson compared the fates of Iceland and the three Baltic countries. They all became sovereign states in 1918; they were all occupied in the Spring of 1940, Iceland by the British, the Baltic countries by the Soviets; in all four countries, the foreign army based there was replaced by another one in the Summer of 1941, in Iceland by the US, and in the Baltic countries by the German Nazis; all four countries became republics in 1944, Iceland by severing the last ties to the Danish king, and the Baltic countries by being forced to become Soviet republics. Seminar in the Hague 12 November 2013. Courtois 1st from left, Landsbergis 1st from right. At the Platform annual meeting, Kurt Schrimm, director of the Central Office for the investigation of National Socialist Crimes, gave a guest lecture on the Demjanjuk case. In connection with the meeting, a seminar was held in the Huis De Boskant in the Hague, on the roots of totalitarianism. There, Stéphane Courtois pointed out that Lenin had been the first one to try the implement the totalitarian idea of a complete recreation of society and of a new man. In fact, Stalin and Hitler and even Mussolini had been his disciples in this regard. 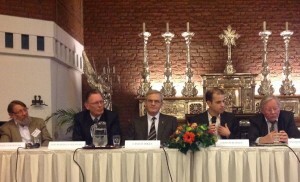 Other participants in the panel were Vytautas Landsbergis, former President of Lithuania and a MEP, Lázsló Tökes, Bishop of the Reformed Church in Romania, a prominent dissident under the communist regime and presently a MEP, and two Dutchmen, Jan Wiersma, former MEP for the Dutch Labour Party, and Professor Theo de Wit. In the discussion, Courtois reminded the audience of the dact that the church was the only significant force which opposed totalitarianism before the 2nd World War, as two 1937 papal encyclicals showed, Divina Redemptoris defending private property rights against communism, Mit brennender Sorge criticizing the German Nazi regime. In the discussion, Dr. Pawel Ukielski, a delegate to the Platform, said that the experience of Central and East Europeans was often overlooked in history books about the 2nd World War. For example, the war was not originally between the Axis powers and the Allied powers, since Hitler and Stalin had in their 1939 non-aggression pact divided Central and Eastern Europe up between the two of them, remaining allies until the Summer of 1941.